on the beach each night in spite of the heat, that’s always fun. 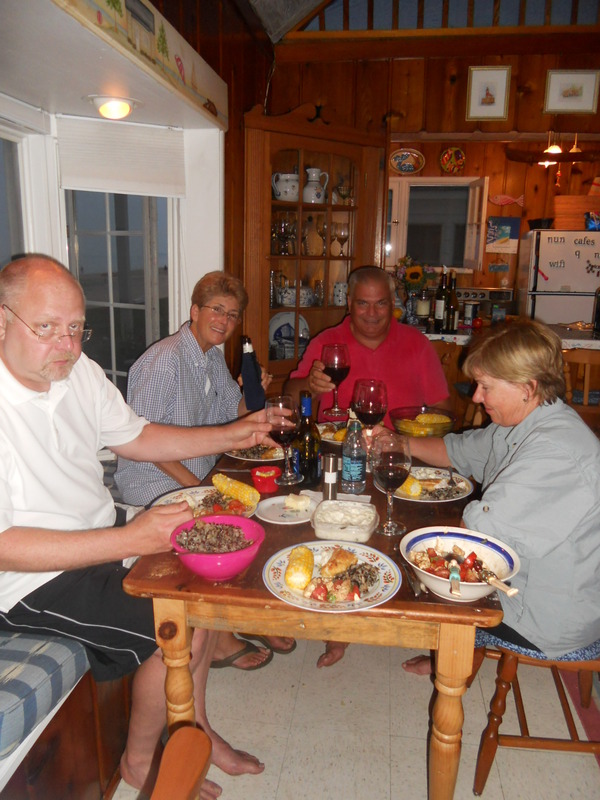 We had two great dinners, leg of lamb on the grill Friday night and pan fried Walleye on Saturday night. 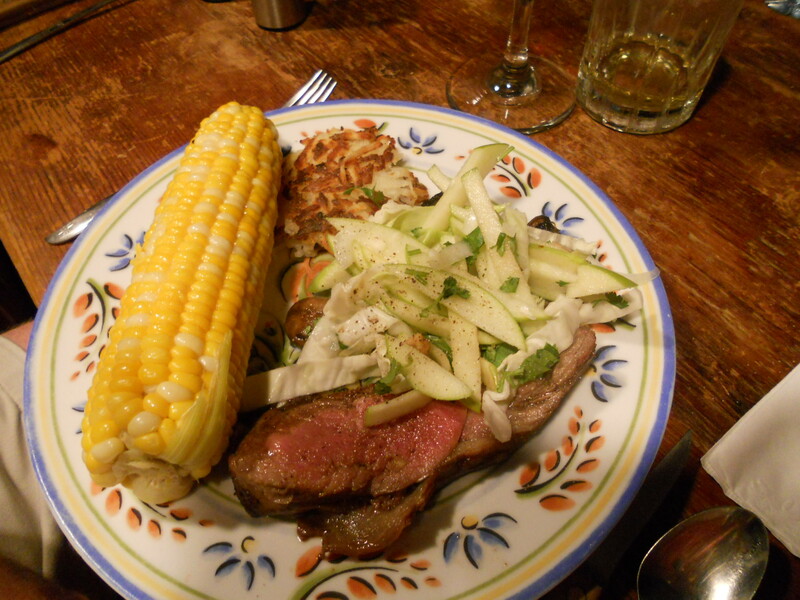 We had delicious local corn on the cob both nights. wanting to stop at all summer. This is the first time it was open as I passed by and of course we had to stop. It’s in the heart of the Amish community in the thumb and about half the shoppers and workers were Amish. It was so great. It has loads of interesting baking supplies as well as fresh baked Amish breads and assorted baked goods and Amish cheeses and butter. It’s only open until 6pm and closed on Sunday, so don’t know when I’ll get there. Even though Mary Beth and I left hours and hours before Craig, Sally and Tim; we didn’t arrive too far ahead after all of our shopping stops. Michigan tomatoes and some great cupcakes, including one that looked just like a mini cheeseburger. They were so cute and so delicious (more about this soon). We’re home and thought I’d make something easy for dinner, here’s what I came up with, a spicy grilled chicken. 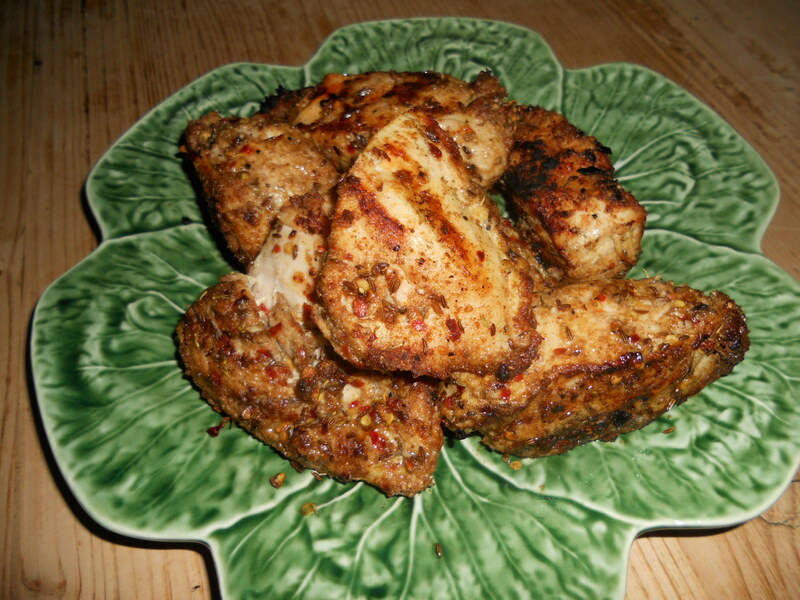 This a quick and flavorful way to enjoy plain old chicken breasts. I’m always looking to make boneless skinless chicken breasts a bit more exciting and this is a real keeper. Give it a try; I can’t imagine you’ll be disappointed. If you’re a bit of a wimp where heat/spice is involved; you may want to decrease the red pepper flakes by half. Mix dry spices in small mixing bowl then add garlic and olive oil and stir until evenly mixed. Add the spice mix to a gallon size plastic Ziploc bag, add chicken and seal shut and mix chicken in bag until evenly coated with spices. Allow to sit for 30 minutes before grilling on preheated barbeque grill for 4 to 5 minutes per side. looks like fun! although i’m wondering why dad isn’t wearing a black shirt and khakis in either picture?? Your receipe is a taste of summer. I’m going to try it out today…in the dead of Winter. Add a few extra red pepper flakes and you’ll feel the warmth of summer. This chicken was great cold for sandwiches too.